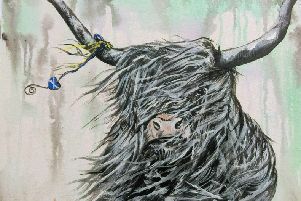 An epic work of referendum art, which explores Scottish identity before Scots vote on independence, goes on show at Traquair House next Saturday. The Debatable Land is a painting by the artist Peter Sacks. The work is a 7ft high, 12ft wide ‘map’ of Scottish and Borders history, complete with ‘rivers’ of words and ‘layers’ of pictures, which viewers can zoom into like Google Earth. “This is a stunning painting for a nation facing its biggest decision in 300 years,” explains the curator who commissioned it, Mark Muller Stuart QC, husband of Traquair’s Lady Laird Catherine Maxwell Stuart, and director of Beyond Borders Scotland: an Edinburgh-based NGO working in cultural diplomacy. Closer up, viewers can tour contours of text and textiles, drawn from Scotland and the Borders by South African Sacks: a Harvard University English professor, and prizewinning poet-turned-painter. Mark elaborated: “These wandering lines of Border ballads, translated Gaelic poetry, the Declaration of Arbroath and the Acts of Union, Bannockurn battleplans, and clan crests – manually typed, burnt, buried or otherwise obscured on ancient and modern fabrics – interweave on the divided landscape, to create different narratives of union and fragmentation. Stepping back again, Sacks hopes, Scots can see the bigger picture – what unites and divides Scotland and England – and so debate and decide who they are in The Debatable Land. The collage’s effect is to travel beyond borders: the aim of Beyond Borders, and its International Festival of Literature and Thought at Traquair every August, which, Sacks explained, inspired his idea for The Debatable Land when he spoke at last year’s event about his love of Border ballads. The programme and box office for Beyond Borders’ 2014 festival, at Traquair on August 23 and 24, is now online at www.beyondbordersscotland.com. Themes for this year’s talks, walks and bike rides include secrecy, the Commonwealth, Ukraine, Syria, food, and Scotland’s referendum – featuring a Yes or No debate, plus Peter Sacks’ will bring his painting to life in one of the new lunchtime Tête-à-Tête sessions.